We managed to get ourselves into another trophy (plate) final this time with the boys U15’s. But unlike like last year (Boys U13’s) when we were vying to win it, this year we were fighting not to come last! 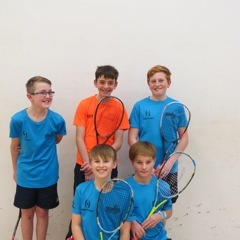 Our first and closest match was against Lancs – having travelled with not a fully fit team both Luca and Noah a little under the weather – Luca would normally have beaten his opponent but on the day didn’t have the energy to do so, Noah also at 4 didn’t get a game, where as our No5 David Offer and Joe Pannell at 2 both managed to win – David’s match went to 5 winning it 3-2 which left James who managed to get his game back to 2-2 but unfortunately lost his match 2-3. The other two counties Glos who were the hosts and Cambridgeshire fielded squads who clearly were stronger and we were unable to make too much of an impression. Glos being the overall winners at the end of the day.